A Boston chef, Sewall is known for his restaurants, Lineage, Eastern Standard, Island Creek Oyster Bar, and Row 34. While sampling lobster brioche sliders and lobster tacos and sipping fall-themed cocktails, I was swayed to purchase his new book. One of the things I love about this cookbook is that it's a local cookbook. It takes the New England seasons into account and is divided into chapters based on them. I also love the stories woven through the book (it's why I love a lot of my cookbooks; they're about more than just the recipes). There were several recipes that immediately stood out to me as I flipped through the cookbook, so for my first recipe, I limited myself to the fall section and found this lovely goat cheese tart. The original recipe makes a much larger tart but I cut it down so it would nicely serve four. The original also called for frisee, but I couldn't find any frisee at the grocery store. I thought mâche would be a nice substitute, and I really love how the pomegranate seeds pop against its dark green color. The tart, with its flaky crust, is incredibly light, and the salad on top gets a nice Dijon dressing, the notes of which pair perfectly with the goat cheese base. With some crisp Fuji apple slices, the finished tart is balanced and bright. It would make a fine starter or even a fun brunch addition. A perfect fall starter, this warm goat cheese tart gets a vibrant, flavor-packed topping of mâche, pomegranate seeds, and apple slices. In medium bowl stir flour and salt together with wooden spoon. Cut in butter with pastry blender. In small bowl, stir together egg yolk and cream. Pour egg yolk mixture into flour mixture. Stir until dough starts to comes together. Knead dough (it will seem crumbly but it will come together), remove from bowl, pat into small rectangle, wrap tightly with plastic wrap, and refrigerate for at least 1 hour. Preheat oven to 350 degrees. Lightly flour countertop. Roll out dough to 1/8 inch thick rectangle. Place in 14- by 4-inch rectangular tart pan. Press into edges and corners and trim any excess. (Rolling over the top with a rolling pin is the easiest way to do this.) Prick dough all over with fork and transfer to freezer. Freeze until dough is firm, about 20 minutes. Bake tart shell for 8 to 10 minutes. Meanwhile, in bowl, whisk together goat cheese, heavy cream, egg, and thyme. Season with salt and pepper. Pour filling into parbaked tart shell, and smooth top. Toss mâche and pomegranate seeds with vinaigrette, and season with salt and pepper. 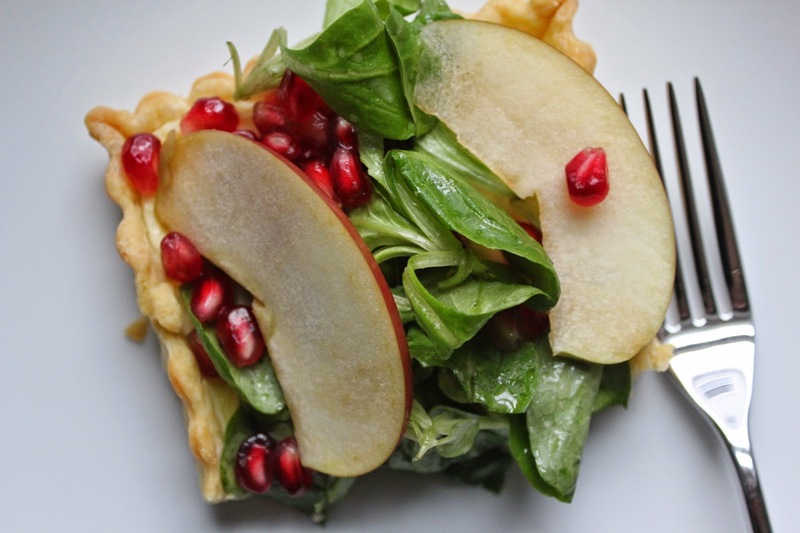 Arrange salad and apples slices on top of warm tart. You might notice that there's not actually any thyme in my tart even though I call for it in the recipe. This is simply because I had planned on picking some thyme from my garden to use in the tart, and being the New England girl I am, I saw it snowing outside and decided not to leave the house! (I made this back in early November.) But having tasted the tart, I think the thyme would definitely make a nice addition, and I think I'd trek out in the snow for it next time. What draws you to a particular cookbook? 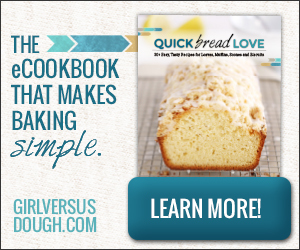 This post contains affiliate links to a cookbook I like. If you follow the link to purchase the cookbook or make other purchases, I'll earn a few cents.